It was called the Space Port, and I spent many an hour there growing up. I'm talking about my local arcade. Kids today don't understand the experience of walking into such a place and blowing your allowance in quarters on the newest game to arrive. It was magical, not just because it was fun, but because we knew we were on the precipice of something big. Every new machine that was wheeled in was a little more sophisticated, a little more impressive than the one before. Technology was improving before our very eyes. The rise of the home console system largely killed arcades, of course. A Jo-Ann Fabric store now sits where the Space Port used to be. I miss it, if I'm being honest. The source of this little walk down memory lane is the documentary Video Games: The Movie, which inspires both goodwill and frustration, in about equal measure. Directed by Jeremy Snead and produced by Zach Braff, the film purports to take you through the history of video games. That's a tall order for a 101-minute movie, so obviously some things are left out. Nonetheless, it does cover several important bases, beginning with a lesson on the tech that made these games possible, followed by a crash course in the most prominent game systems. Video Games: The Movie also covers the way the ill-fated E.T. Atari game (which I owned as a kid) caused the floor to fall through on the gaming market, and how Nintendo's NES system eventually brought it back. The move of video games into the mainstream is discussed, as is the issue of whether games promote violence. Various notable game designers appear to offer thoughts on these topics, along with celebrity gamers, including Wil Wheaton, Chris Hardwick, and former G4 host Alison Haislip. Sean Astin provides enthusiastic narration. Video Games: The Movie offers a wonderful museum tour of gaming. Cool old TV commercials and magazine ads are used liberally, and the commentators do a wonderful job of describing the impact each system or groundbreaking game made upon release. The mix of information and perspective certainly does convey the power of the medium. Video games came about almost accidentally – people had new tech they didn't quite know what to do with – but now there are visionaries, working to bring players experiences that are increasingly interactive and immersive. The journey from the first Pong game to the types of virtual reality machines now being introduced is undoubtedly fascinating, and Video Games: The Movie charts it well. The other selling point is the fun use of game footage when analyzing influential titles/systems. So many of the classic (and, at times, not so classic) games are represented. You can tell that the filmmakers are passionate gamers themselves, as their love shines through at every turn. Here is a documentary that respects gamers and game designers, rather than seeing them as nerds or geeks. If a video game has ever meant something to you, the movie's affectionate approach will prove pleasing. And yet, Video Games: The Movie stays very shallow. There's nothing here that your average gamer doesn't already know. This is Video Games 101, when the people most likely to be interested in seeing it will want to learn something much more. Perhaps the best example of shallowness is the discussion as to whether games can promote violence. There are dozens of first-person shooters where the player takes on the role of armed soldier/criminal/whatever and has to gun down assorted enemies. The issue is brought up, and the commentators all offer some variation of That's ludicrous! There's not one single person on-camera to represent, or even verbalize, the allegations made against such violent games. I agree games themselves don't cause violent behavior, but surely they might be one of many negative influences on someone who is mentally unstable. Why blow the issue off when a studied examination might prove enlightening or provocative? Video Games: The Movie isn't really interested in doing anything other than celebrating games. Anything remotely negative is apparently off-limits. The violence angle, rightly or wrongly, is a big part of the story, and to dismiss it summarily is a glaring oversight. That sort of selective coverage is indicative of the documentary. It's disappointing, too, that there is very little on arcade games or handhelds; the focus is almost entirely on consoles. If you're going to tell the full story of video games, you can't leave out the Game Boy, the Nintendo DS, or Angry Birds, for example. And while the game footage is fun to see, there's an over-reliance on music montages featuring it. After the third or fourth one, it starts to feel like the movie is simply eliciting a Pavlovian response by showing beloved games the target audience will cheer for. In the end, Video Games: The Movie is breezy and entertaining, but it's also obvious and simplistic. It works better as a simple celebration of gaming than it does as a comprehensive exploration of them. 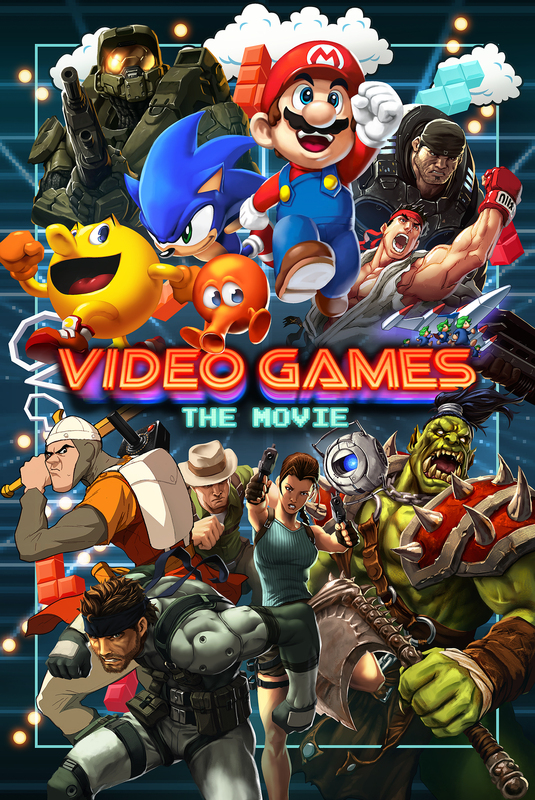 Either way, I hope it becomes successful enough that someone releases a tie-in: Video Games: The Movie: The Video Game. Video Games: The Movie is unrated, but contains discussions/clips of mature video game content. The running time is 1 hour and 41 minutes.